For the adventure traveler that prefers the ocean waves, most popular underwater pursuits are not without risk from marine life. Jellyfish (more properly, jellies) are fascinating creatures. But, a diver or swimmers first encounter with them can be a painful one and frightening experience. In one of our offbeat Globetrooper features, we study how to treat jellyfish stings. Also, how to avoid the danger in the first place. Water-themed trips, be they scuba diving, sailing or snorkeling, all carry some risk of exposure to the dangerous creatures of the sea such as coastal jellyfish. For those of us who enjoy the thrill of water activities when traveling, it definitely pays to also be aware of some of the risks from these creatures that exist in certain parts of the world. All jellyfish possess specialized, microscopic structures called nematocysts. Which when triggered, shoot outwards like tiny harpoons. Jellyfish use nematocysts to collect food and also for defense. While some are merely sticky, others contain toxins which produce the familiar sting. A sting can range in intensity from irritating to life-threatening. Clearly, if thrill seeking swimmers are unlucky enough to have a close encounter with a stinging jellyfish, what should they do to alleviate the pain? Chances are, swimmers won’t see the jellyfish that stings them. Storms often break up jellyfish tentacles into small pieces which can still sting. Tiny larval jellyfish are sometimes present in great numbers, but often unseen. Some jellyfish, such as the dangerous Portuguese man o’ war, trail tentacles underwater as far as 165 feet from their floating bodies. Depending on the species and the severity of the sting, symptoms may include intense pain, skin irritation, and itching, a visible rash, or even raised red stripes or welts. More severe reactions are rare and often occur due to allergies or when a large area of the body is affected. These reactions may require medical attention. While most jellyfish stings are a minor annoyance, some can be serious. Certain box jellyfish species, found in Indo-Pacific seas, are responsible for many fatalities. 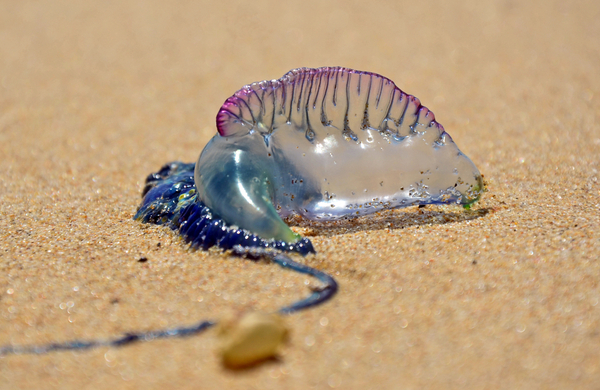 The Portuguese man o’ war, commonly found in tropical waters worldwide but sometimes ranging further north and south, has a sting described as feeling like a “lightning bolt”, and has been implicated in several fatalities. Jellyfish stings covering large areas of the body are a cause for concern. Severe stings can cause a systemic reaction. In this case, symptoms not only includes pain but might nausea, vomiting, dizziness, fever, muscle spasms, or trouble breathing. Victims experiencing these symptoms should see a doctor at once. First, remove any tentacles remaining on the victim’s skin by using sand or a towel to protect hands. Tentacles which stay on the skin may continue to sting. Rinsing the affected area with salt water will help get rid of tentacle fragments (rinsing with freshwater will activate more nematocysts, doing more harm than good!). A variety of substances have been recommended to neutralize the remaining nematocysts. Many of these substances have not been scientifically tested. 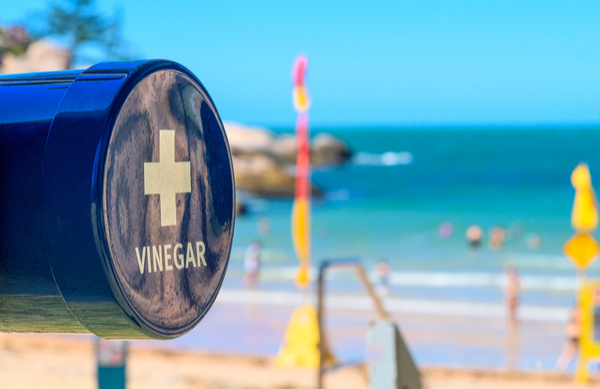 One that has is vinegar; an Australian study found that vinegar was effective for neutralizing nematocysts of some, but not all, jellyfish species. Other home remedies include hot water, rubbing alcohol, meat tenderizer, baking soda, lime juice, and even urine. Many swimmers swear by one or the other, but scientific studies are lacking. Some experts claim that remedies such as alcohol or urine may actually exacerbate the sting. While it might be worthwhile to experiment with different remedies (perhaps not urine), vinegar, either poured directly on the affected area or applied on soaked paper towels, is probably the best bet. Commercial creams and sprays containing antihistamines or painkillers can also be used for immediate or long-term relief. One spray containing the painkiller lidocaine is marketed specifically for jellyfish stings (“Jellyfish Squish”). It’s not always possible to avoid jellyfish, but a few simple steps can reduce the chance of an encounter. 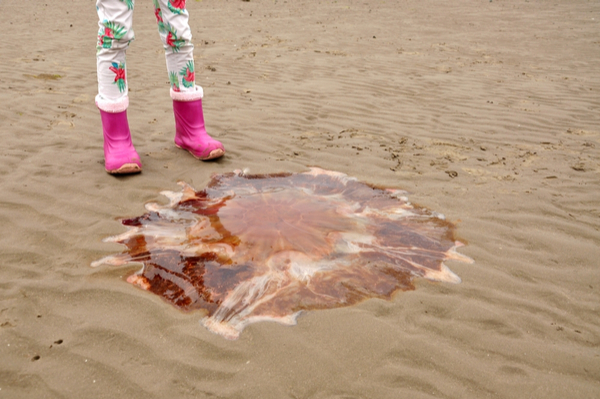 Watching out for jellyfish washed up on the beach is a good first step – their nematocysts can continue to discharge after death. Swimmers who go to a beach with a lifeguard should look for a purple flag (the warning for dangerous sea creatures of all kinds). Once swimmers are in the water, stings can be hard to avoid, but a new product called Safe Sea lotion might offer hope. It uses the same chemical ingredient clownfish use to avoid getting stung by sea anemones, preventing nematocysts from discharging. Adventure travelers, in particular, are more prone to swim or scuba dive in dangerous waters. Jellyfish and other water creatures are a hazard to swimmers. However, a traveler either does not go on the trip or they mitigate the risk. Sometimes though, adventurers can be caught by surprise and stings are inevitable. Depending on severity, the effects of a jellyfish sting can last from a few minutes. Sometimes a few weeks and could range from irritating to life-threatening. It’s not always possible to avoid stings, but with a few simple steps, you can reduce the pain. Many common jellyfish species are harmless to humans. For people who spend a lot of time in the water, it’s worth learning to identify them to get a close-up view of these fascinating creatures without worrying about their tentacles.